Baseball and blue skies mean spring is here! Going to college in the amazing city of New York provides us with a lot of awesome opportunities to take advantage of what the city has to offer at a relatively cheap price. Museum admission, concert, and theater ticket discounts are relatively popular – but there’s one hidden gem (especially for sports fans) for students in NYC that’s not quite as popular: cheap tickets to Yankees and Mets games. Spring training is almost over for these two teams and cheap tickets to many of their home games are available as soon as next week. Going to a Yankees or Mets game is a classic New York experience that you have to do before you graduate! Mets tickets are only $10 at the ticket window on the day of the game and can be purchased online. Citi Field (where the Mets play) is located in Queens and you can get there via the 7 train, which departs from the 42nd Street/Times Square subway station. The ride in itself is pretty cool because for the majority of the ride you are above ground and can see some amazing views of Manhattan and Queens. The ride takes a little less than an hour (get on the express 7 train if you can, look for the red diamond). Get off at Mets-Willets Point. This is Jeter’s last season – watch him make it count! Going to a Yankees game can be a bit more expensive. On particular game days, they offer half-priced student discount tickets. The schedule of those particular games can be found here. However, for almost every Yankees home game, they offer tickets near the outfield for about $20-$30. Yankee Stadium is in the Bronx – take the 1 train to 59th Street-Columbus Circle and then transfer to the D train. Get off at 161st Street. You can get there in about 45 minutes. For both Mets and Yankees games, bringing your college ID is ESSENTIAL to getting these discounted tickets. Sometimes, if you get to the game early enough, you can get freebies when you walk into the stadium (bobbleheads, tee-shirts, calendars, etc). 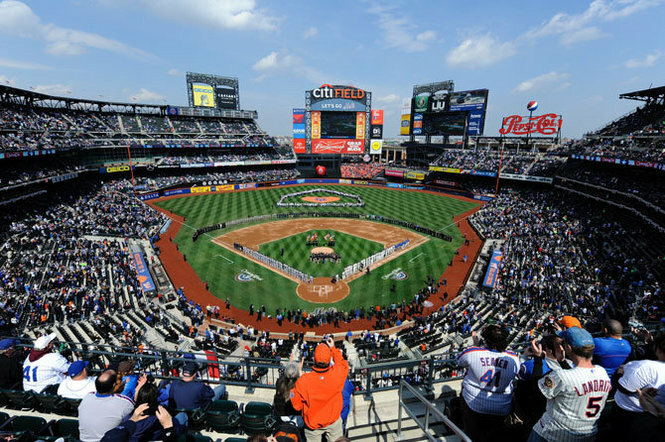 The Mets will play Opening Day at Citi Field against the Washington Nationals on Monday, March 31 at 1:10pm. The Yankees are starting the season away but will be playing their home opener against the Baltimore Orioles on Monday, April 7 at 1:05pm. Check the schedules for the Mets and Yankees for upcoming games, deals, and giveaways. Play ball! Images courtesy of SILive.com and myCentralJersey.com. Thank you very much for this game. Personally I prefer games guns , do you?